Unify and manage data to reach your target at any step of their omnichannel path. Hub Score provides a highly customized, relevant experience to increase ROI on all channels: Emails, SMS, Voice, Mobile Notifications, Social Media and Points of Sale. 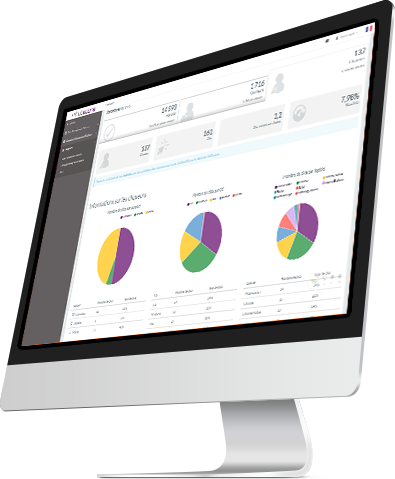 Create, measure, analyze and improve your marketing operations with one user-friendly platform. Innovation is central in our Customer & Data Centric Plaftorm. At the crossroads between a real exchange platform « HUB » and an advanced analytical approach « SCORE », our solution epitomizes the new generation of Data Management and Client Path Optimization. Discover how to reach your target with the right message at any step of their client path. Emma is a LA Fashion Addict. Follow her customer path below. Emma receives the « Summer tips » newsletter and opens a customized email from Hipfashion.com on her mobile phone. In the products showcased, a shirt catches Emma’s attention. She clicks on it and visits the product page. Emma receives the "Summer Tips” newsletter created autonomously by the Hipfashion email manager, using Hub Score's templating module. Emma returns to Hipfashion.com and her attention is immediately drawn to a sale on the same shirt she had viewed on the products page just an hour earlier! Delighted she buys the shirt. After receiving her order confirmation, Emma receives a mobile notification with a promo code on a pair of jeans that would match her newly purchased shirt. Later in the afternoon, Emma calls Hipfashion and the call center operator accesses her profile. The operator informs her that her purchase will be available for pick-up at the closest retail location at 6 pm. Hub Score triggers a confirmation email and satisfaction survey to be delivered to Emma the next morning. Emma receives an email displaying the summer’s top looks. She also views a product recommendation that is generated from an analysis of her preferences, profile, web and email history. She sees two scarves and clicks through to view their descriptions. Recommendation engine of contents and offers, analysis of repetitive patterns to optimize commitment and conversion. Emma gets her shirt in store. With the ibeacon module at the store, Hub Score detects her presence and triggers a mobile push notification with a promo code for scarves similar to those viewed earlier on her mobile phone. Emma leaves the store with a beautiful shirt and two matching scarves! For over 15 years, we have helped leading brands around the world reach their marketing goals. To request a demo, ask a question or just to say Hi! complete this form and we will get back to you! Our experts would be glad to help you. Hub Score is a leading company within Key Performance Group. With its cutting-edge platform, Hub Score epitomizes a new generation of DMP & Marketing Automation. Hub Score is the perfect combination of a real « HUB » exchange platform and an advanced « SCORE » analytical approach.